Do you produce videos or podcasts? If so, then you’ll want to find royalty free music. Music put the finishing touch on your videos. The only problem is that if you don’t have the rights then you’re liable — a lot like the need for using free images in your content. There’s a chance that your video could be taken down if you’re hosting it over on YouTube or Vimeo. Don’t let the ‘free’ part of it fool you – they’re still great tracks by serious artists. The following are a few different websites you can use to source this royalty free music. Dan-O is a talented musician that has released numerous tracks under a creative commons licensee. His work has been used by companies like Disney, Stanford, 3M, and IBM. To use the tracks all you need to remember is to credit Dan-O. Otherwise you’re able to make a donation to receive a package of his tracks in higher quality. Dan-O frequently releases new tracks in many different genres. They make a perfect match for videos of all types. I would recommend sourcing from him if you’re in need of royalty free music. 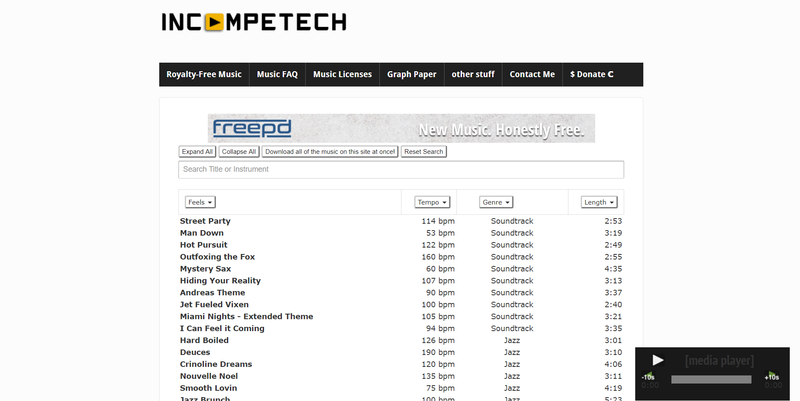 Incompetech hosts a massive selection of royalty-free music that range from all types of genre’s and “feels”. This selection spans genres from African and Classical to Horror and Latin. The feels selection allows you to search for the right type of music for your project whether it’s meant to be aggressive or eerie or mysterious or unnerving. You will need to add credit to the musician if you choose to use their work. The site also has a package for $78 which allows you to download all of the files on the site. Royalty-free music isn’t necessary free. It’s great that we have musicians and artists creating free tracks but the selection is generally limited. It’s worth it to make the investment into music if you’re having trouble finding the right track for your project. AudioJungle is a great place to start digging into the deeper selection of royalty-free music. They host over 134,000+ audio files. The selection includes just about any and all genres of music, music packs, sound effects, and source files. The average of a great piece of music will generally cost you less than $20 which is a real steal for the quality and length of work. What is a Niche Market? The Definition, Its Pros and Cons, and a Niche Market Example.